The Gold Medal Series water processors incorporate a patented mixed media bed which uses only materials recognized as being safe by the FDA and the EPA. 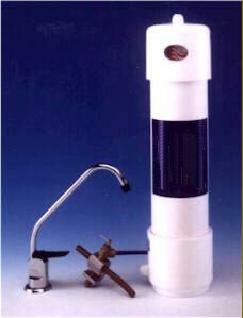 The Gold Medal Series is ideal for use on municipal water systems and for well water systems which have total dissolved solids (TDS) of less than 250 ppm.However, these systems are not intended for use where the water is microbiologically unsafe, or for water of unknown quality, without disinfection either before or after the unit. Granular Activated Carbon (GAC) has proven to be the most effective media known to man for the removal of organic contaminants. It attracts organic contaminants in much the same way a magnet attracts iron filings. GAC absorbs and adsorbs chlorine and other chemical compounds and gases. It is the preferred method of protecting drinking water from trihalomethanes (THMs), PCEs, EDBs, PCBs, DBCPs, chlorine, carbon tetrachloride, trichlorethylene, nitro-enzenese, chloramines, gasoline, naphtha, radon, alcohol, herbicides, insecticides, pesticides, iodine, silvex, calcium hypochlorite, hydrogen sulfide, methylene chloride, detergents, and numerous other chemical compounds in existence. GAC traps organic material and fibers, such as asbestos. It removes bad tastes, coloration and odors. KDF is our patented mineral media. Even though GAC is sufficient to correct 85% of the contamination problems, there exist water treatment needs that cannot be effectively addressed by carbon processes alone. For this reason, Dyna-Pro Environmental has added this patented mineral media to the Gold Medal Series processors. KDF complements in every way the performance of the GAC being used. This patented media removes inorganic contaminants, such as iron, sulfur, heavy metals like lead, mercury, arsenic and cadmium. It also removes chlorine, so it lengthens the life of the GAC. KDF kills bacteria, fungus and algae. The Gold Medal Series processors, while removing harmful organic and inorganic contaminants, do not remove naturally occurring beneficial minerals, such as calcium, from the water. This series of processors is without a doubt the very best and most efficient system of purifying water, while leaving the minerals in the water. It is also the most cost efficient means of producing purified water in larger volumes. Typically, each of the Gold Medal Models will process municipal water at less than 1 cent per gallon. • Gold Medal Counter Top, comes with a diverter valve and attaches quickly to the kitchen faucet. 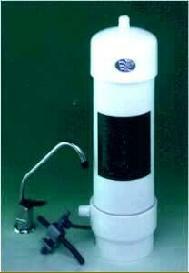 To dispense purified water, just pull out the button on the diverter, and push it in to stop the flow. This model is ideal for apartment dwellers because it is quickly removed. It can be easily transported to and from the cottage or holiday hotel. • Gold Medal II, under counter model, attaches compactly under the sink. It comes with an extended reach bar-tap and a self-piercing saddle valve for easy installation (no soldering is required). This model comes with a 3 year pro-rated warranty and will effectively treat 8,700 gallons of municipal water. • Gold Medal I, under counter model, attaches compactly under the sink. Unit comes with an extended reach bar-tap and self-piercing saddle valve for easy installation (no soldering required). This model comes with a 5 year pro-rated warranty and will effectively treat 25,000 gallons of municipal water. Flow rate is approximately 1 gallon per minute. • The PRO II Portable, pour-through water processor uses the same technology as the Gold Medal series. It will process up to 5,000 gallons of municipal water, and up to 3,000 gallons when utilizing water from rivers, brooks and streams in conjunction with a pre-disinfectant like iodine or chlorine drops to sterilize source water. These substances are then removed by the Pro II, along with the other contaminants. This compact unit is self-contained and weighs only 32 ounces. • The "Big Daddy" This under counter model, attaches compactly under the sink. Unit comes with an extended reach bar-tap and self-piercing saddle valve for easy installation (no soldering required). This model comes with a 5 year pro-rated warranty and will effectively treat 35,000 gallons of municipal water. Flow rate is approximately 2 gallons per minute.